Both women and men want to own thick eyebrows. Well-shaped and thick eyebrows can help improve your look. Thin and sparse eyebrows, on the other hand, can make you look dull and older. Over-plucking, along with nutritional deficiencies, aging process, medical conditions such as hypothyroidism, alopecia areata and eczema, and poor cosmetic application can lead to the eyebrows to get sparse and thin. Some people often use medical treatments such as chemotherapy and radiation to have thicker eyebrows, but they can cause hair loss. Instead of depending on these treatments, you can quickly deal with the problem of thin eyebrows by using some natural remedies. These natural remedies will aid in making your eyebrow hair thicker and stronger. 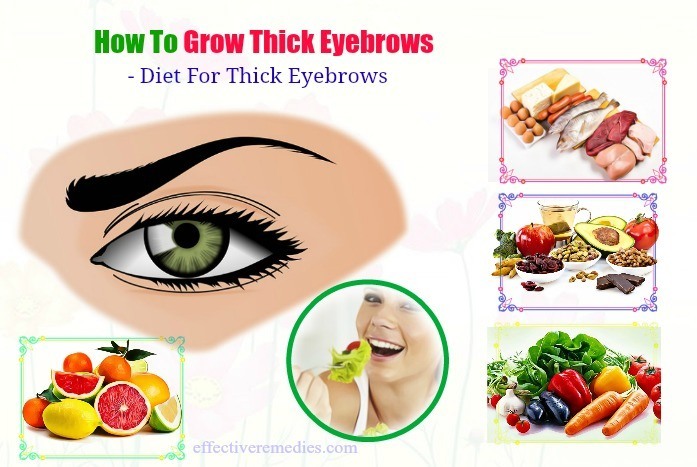 Continue reading this article on Effective Remedies to know how to grow thick eyebrows for women and men naturally. Eat foods rich in vitamin A because it helps to guard hair follicle cells against damage caused due to free radicals. You can find this vitamin in red pepper, carrots, and sweet potatoes. Eat foods rich in vitamin C such as oranges, lemons, peppers, papayas, and broccoli. This vitamin assists in producing and maintaining healthy collagen in hair follicles. Eat foods rich in vitamin E such as almonds, basil, peanuts, olives, and spinach. It is helpful for maintaining hair follicle integrity. It also serves as an antioxidant and promotes healthy skin and hair. Consume foods high in protein such as cheese, tofu, beans, yogurt, and lentils. Consume omega-3 fatty acids rich foods such as avocados, walnuts, salmon, and olive oil. Consume foods high in iron such as milk, fish, lean cuts of meat and green vegetables. Consume foods high in biotin or the B vitamin to help your hair grow. Some foods rich in biotin include eggs, almond, yogurt, and salmon. If required, you can also take multi-vitamins and other supplements. Before using them, consult your doctor first. Onion juice aids in promoting hair growth, preventing hair loss and encouraging hair follicle thanks to its sulfur. The sulfur also improves the collagen production necessary for proper eyebrow growth. Grind the small onion to extract its juice. Start massaging this juice into your eyebrows for roughly 5 minutes. Let the onion juice dry naturally and afterward, wash it off by using the mild cleanser along with cold water. Try this way once daily for a couple of weeks. Fenugreek seeds are a vital component of hair care. They are helpful for enhancing hair growth thanks to their protein and nicotinic acid. It promotes fresh hair growth by rebuilding the hair follicles. Firstly, soak the fenugreek seeds in water for a minimum of 5 hours and later grind these soaked seeds well to get a thick paste. Then, add some almond or coconut oil to the paste. Start applying this paste on your eyebrows before your bedtime. Keep it on an entire night and in the morning, wash with warm water. 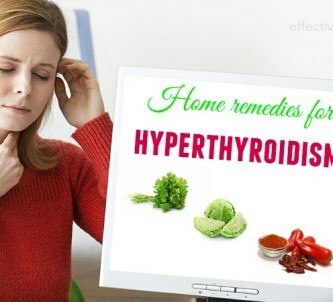 For quick results, follow the remedy two or three times per week for about two months. The hair of your eyebrows is mainly made up of keratin protein. Egg yolks can be useful for making your eyebrows appear thicker since they are full of protein. Along with that, they are rich in vitamin D that helps improve the health of the hair, thus making the eyebrows thicker and longer. Break an egg at first and later separate its yolk. Then, beat the egg yolk until you attain a thick, creamy consistency. Use the cotton swab to apply it on each of the eyebrows. Wash it off after 15-20 minutes with cold water. For satisfying results, use this protein treatment one to two times in a week. Aloe vera is beneficial for improving the skin texture and stimulating the hair growth. 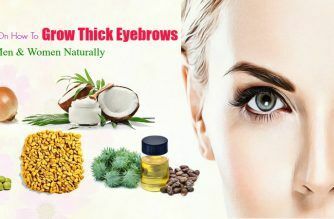 It can make your eyebrows healthier and thicker by nourishing the hair follicles thanks to its moisturizing properties. Not only that, it even makes the skin near the eyebrows very soft. Pick up the aloe vera leaf and extract the gel from it. Gently massage the fresh gel over your eyebrows. Let it sit for roughly 30 minutes and rinse with lukewarm water. Just mix the aloe vera gel with some coconut oil or honey. Start applying the mixture to your eyebrows. Use enough amounts of water to rinse it off after around 30 minutes. Repeat either of these methods once daily for a few weeks for best results. 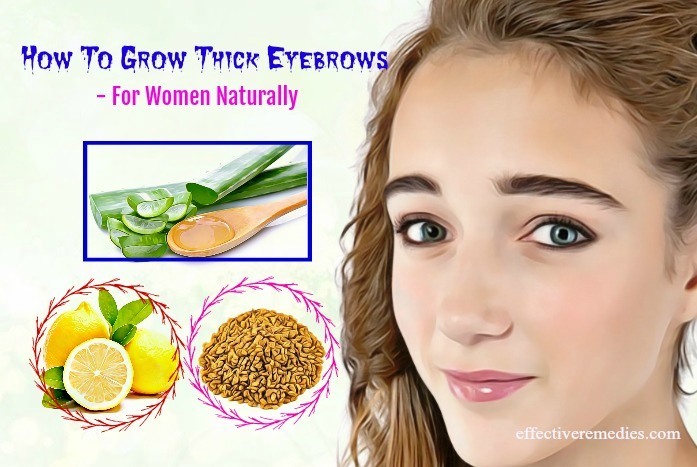 If you are looking the natural ways on how to grow thick eyebrows for women, then opt for lemons. This citrus fruit is rich in vitamins B and C, folic acid along with many other nutrients so that it can boost the procedure of growing eyebrows. Take a slice of lemon and just rub it over your eyebrows. Let the juice work on for fifteen minutes before rinsing with warm water. Firstly, grind the peel of the lemon and later put it into the coconut oil. After that, let the mixture stay for at least two weeks in a dry, cool place. Once ready, you apply it on your eyebrows with the support of a cotton ball. Keep it on overnight and the next morning, wash it off. Follow either of these processes once every day to enhance your eyebrows. Almond oil is another fantastic way on how to grow thick eyebrows quickly and naturally. It’s ideal for nourishing and stimulating the hair growth due to its vitamins A, B and E. It additionally helps to prevent hair loss by strengthening the hair shaft. Prepare a small quantity of almond oil and massage it on your eyebrows. Leave your application on overnight and in the morning, rinse it off. Try this remedy daily. Note: If you’re allergic to almonds, avoid this process because it can result in swelling, itching and skin irritation. It is beneficial for retaining moisture in the area and conditioning the hair. As a result, it will help the eyebrows grow thicker and stronger by keeping the moisture from escaping. For this treatment, you just need to take some petroleum jelly and apply it to your eyebrows. Keep it on all night and in the morning, remove it. People with acne-prone skin should not use this remedy because petroleum jelly is high in oil. Applying tea tree oil is another excellent way to grow thick eyebrows for women. It can be helpful for unclogging the pores and fading away dirt & dead skin cells. Along with that, it assists in boosting hair growth and dealing with hair loss and thinning. Here is how to use this oil to help improve your eyebrows. Mix the tea tree oil with the coconut or olive oil. Apply the oil mixture to your eyebrows while massaging it for a few minutes. You leave it on an entire night and rinse it in the morning. For quick effects, follow the method nightly. Curry leaves are useful for facilitating the restoration procedure of the skin. Plus, they can remove dirt and dead skin cells by opening up the hair follicles. Besides, they exhibit the antioxidants and amino acids, which all work effectively on moisturizing the skin and strengthening the hair follicles. Moreover, they are potent in improving the overall quality of your eyebrows owing to their vitamin B6, proteins, and beta-carotene. At first, crush a few curry leaves and next, put these crushed leaves in one cup filled with water. Leave it on for several hours and strain. Afterward, apply this blend to the eyebrows with the cotton swab. Leave the application on overnight and the following morning, rinse it off. You can use this simple but effective remedy three or four times per week. Raw milk works wonder in facilitating the growth of eyebrows since it is a powerhouse of vitamins and nutrients. Switch to this amazingly effective raw milk remedy for attaining fuller and thick eyebrows. According to many studies, hibiscus can be perfect for boosting hair growth. Both its flowers and leaves help to stimulate the hair growth and strengthen the hair roots. Try this ayurvedic remedy with hibiscus flower for getting full eyebrows naturally. Add several hibiscus flowers to a mortar and pestle at first and later grind them to make a fine paste. Then, apply it to your eyebrows and let it dry for around 25-30 minutes. Wash with warm water and after that, pat your skin dry. Follow it once daily for thicker eyebrows. Stress is one of the main factors that restrict the hair growth. Vitamin E oil possesses the tocotrienol that helps to lower the stress. Besides, it’s also useful for improving hair growth and strengthening the hair. For this purpose, take a vitamin E capsule. Open it and remove its content. Massage the vitamin E oil on your eyebrows. Leave it overnight and in the morning, rinse with water. Men can look attractive only with small changes in their eyebrows. 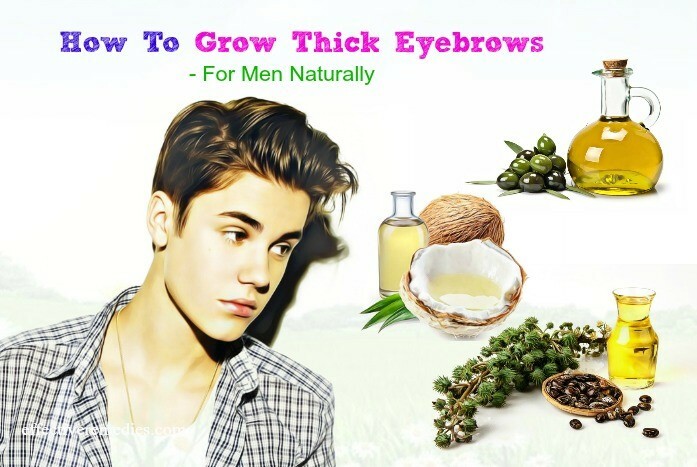 Below are some of the best ways on how to grow thick eyebrows for men. Take a look! Castor oil helps to nourish the hair follicles, as it is full of vitamins, proteins, antioxidants and fatty acids. These agents are also necessary for improving hair growth and thickness. Apart from that, it can prevent the growth of microorganisms, which hinder proper hair growth. For this method, you pick up a Q-tip or cotton swab and soak it in some castor oil. Then, apply it to each eyebrow and gently massage for 2 to 4 minutes daily. You will start to see a clear difference in your eyebrows and their thickness after only one month. Olive oil can help you attain darker and thicker eyebrows since it is chock full of vitamins A and E. Vitamin E helps to nourish the strands while vitamin A can enhance the production of sebum that promotes hair growth. All you need to do is warming several drops of olive oil. Later put it on your fingertips and massage your eyebrows for four minutes nightly for a whole month. It will make your eyebrows thicker and finer. Coconut oil is a common ingredient in many hair and skin care products. It can make your hair thicker and skin supple owing to its protein and vitamin E. Its vitamin E and iron can enhance the healthy dark and thick eyebrows. It further helps to moisturize and condition your brow hair to quickly grow back out thicker and healthy. Warm several drops of coconut oil and pour it on your fingertips. Slightly massage your brows for five minutes nightly for about one month. The next morning, rinse off by using warm water. 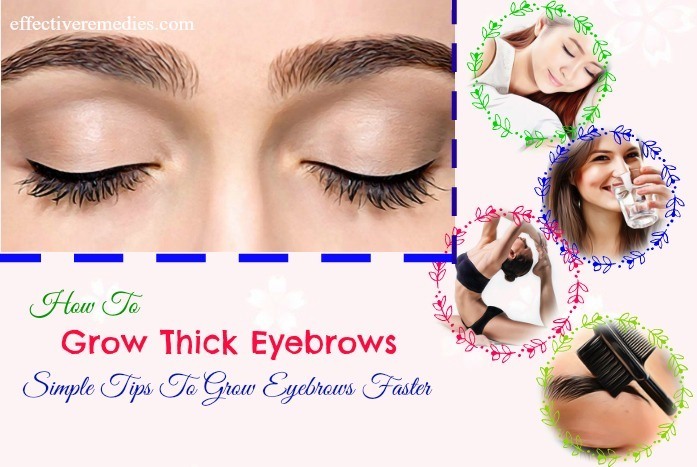 Here are several tips to bear in mind when you want to get thicker eyebrows quickly. Avoid plucking, waxing or tweezing the eyebrows too often. Avoid rubbing or scratching your eyebrows too hard. When using an eyebrow pencil, avoid pressing your brows too hard. Don’t wear makeup because excessive face makeup can reduce the eyebrows growth. Avoid creams and lotions since they clog hair follicles. Try massaging your brows gently on a daily basis to eliminate dead skin cells and help increase blood circulation. Comb your brows by using a spoolie brush daily. Sleep at least six hours every day to help the eyebrows grow thicker and faster. Reduce stress since it can lower the growth of the eyebrows. A few methods to control stress consist of yoga, massage, meditation, going for a walk, talking to a friend and journaling. Drink enough water throughout the day to keep the body hydrated and plump eyebrows and enjoy silky hair. Exfoliate your brow area thrice per week. This way helps stimulates the follicles and promotes hair growth. Do exercises daily to help improve your circulation. Daily exercise can be helpful in distributing the natural oils of the hair, which can make the hair healthier and accelerate new growth. Did you find this post helpful? Do you know other methods on how to grow thick eyebrows naturally for women and men? Share your experience, queries, and suggestions in the comments section below. All of the contents provided in this article are for informational & educational purposes. We recommend you consult a healthcare professional to determine which method is appropriate for you.